Before I jump in to the application review of Reflectly, I wanted to start with my personal story of journaling. I’ve always been interested in journaling. I remember getting my first diary around the age of six. It was that was made especially with little girls in mind. The front was a hard cover with rainbows and kittens on it (of course), and it had a small lock that came with two keys. Inside the pages were a light pink and had a kitten at the bottom of each one. The whole diary was about 70 pages, and I thought it was the coolest thing ever. I used this diary for all of a week before forgetting about it, and skipping a day. From then I tried a few more times to continue but they motivation was lost, and I got bored of the diary. I remember finding that diary a few years ago hidden away with just a few pages. That journal was the first I had, but there have been more diaries with similar stories to the first one. It isn’t that I didn’t want to keep it up, actually I’d end up regretting it every time I let go, but it became uninteresting so quickly. When I found out about Reflectly though, I thought I could give journaling one more chance. 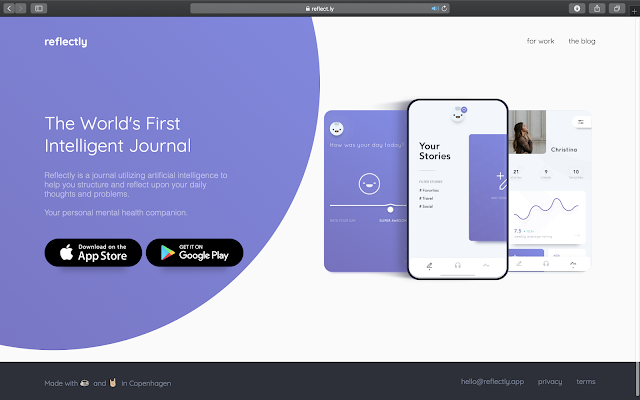 Reflectly is an app for journaling, taking away my first problem of losing the journal or misplacing it, and kind of like a scrapbook you can upload photos. You can rate each day and get reminders. With AI technology Reflectly offers quotes, prompts, and relevant questions when you’re journaling and the more you use it the more relevant the questions are to you. After trying it for a little while, I can say that this is so much better than traditional journaling. It’s so easy to just pull out my phone for a few minutes and type out how my day is going. Not going to lie I’ve used it quite often at work. You know when a project is running a little behind, or your project scope increases, and you just need to vent for a few minutes. Not only does it help me to do this bit of journaling right then, but then I can look back later that evening and reflect on it. At the end of the day I go over the rest of my day relaxing just before bed. The prompts (which are tailored to me) get rid of the writers block that can make journaling hard and the inspirational quotes are a great way to end the day. Unlike traditional diaries I haven’t had any trouble getting all my thoughts out and really enjoyed doing so. Looking back at the past days, by things like how I rated the day is so interesting to see, and the whole activity of journaling especially with Reflectly feels so therapeutic. It has really helped me get though the tougher days and is an app I can see myself using for a long time to come.